The science of skull identification relies on the skills of close scrutiny and the study of physiology. Skulls hold a fascination for many people. For some they are symbols of death or fear, while for others physical representations of animals and the expressions of the stories of their lives. Skulls can tell us many things about an animal, including the species, its approximate age, size, health, what it ate, whether the animal was male or female and even how it died. Skulls identification is best done by breaking down the skull into its parts. 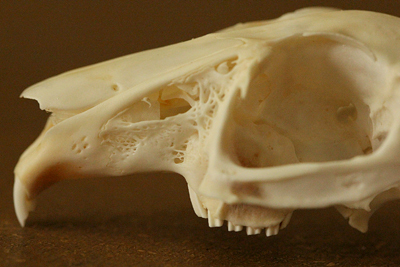 For the sake of simplicity, we will stick to mammal skulls here in this article. There are four general regions to a mammal skull: the rostrum, zygomatic arches, braincase and mandibles. The rostrum is the portion of the skull that contains the upper teeth, nose and palate. The zygomatic arches are the bones arching outward from the braincase and rostrum to form the cavities known as the "orbits." These cavities contain a space for the jaw muscles and for the eyes. The braincase is the part of the skull behind the rostrum, that includes the cavity where the brain is contained. The mandibles are the lower jaws, which contain all of the lower teeth. The teeth found within a skull tell us several important things about the animal to which they belonged. First, what the animal ate. Next, what general group of animals it belongs to. Also, how much and what kind of wear they have had through use. Rodents have a pair of chisel-like incisors at the very front of their rostrum and a pair at the very front of their mandibles. 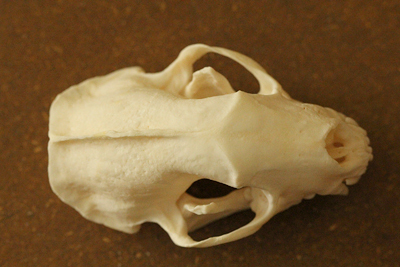 In most rodents, these have an orange enamel, as in the muskrat skull in the image above. Behind the incisors is a gap of no teeth, then a line of molars that all look very similar. 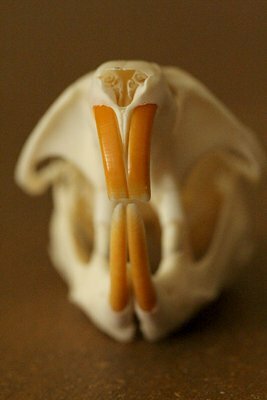 Lagomorphs - rabbits and hares - have similar skulls, only they have 2 pairs of incisors (one behind the other) in their upper jaws, molars that are squashed horizontally and a porous structure to their skulls called fenestrae. Look closely in front of the orbits to see the fenestrae in the skull of this snowshoe hare in the image below. Insectivores have many teeth, many with tall cusps (points). Shrews have specialized incisors that stick forward like a pair of forceps, and all their teeth have a brownish-orange tip. Their skulls are also tiny and lack zygomatic arches. 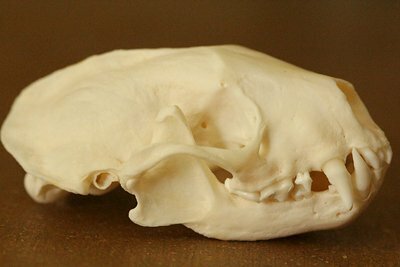 These can be distinguished from moles (which are another type of insectivore) because mole skulls have zygomatic arches. 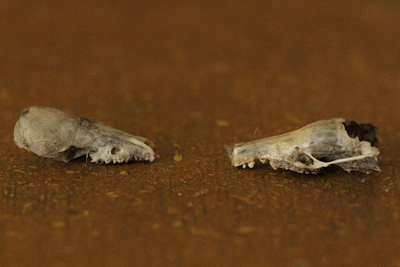 In the image below, the shrew skull is on the left and the skull of a small mole is on the right. Carnivores and omnivores have several types of teeth. At the very front of their skulls are a row of small, sharp incisors. Immediately behind these are the large, pointed canine teeth. 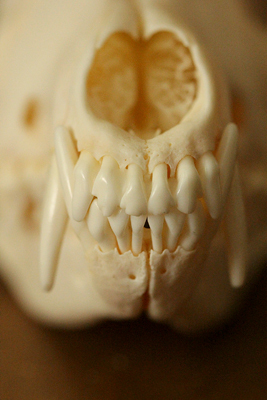 Notice the incisors and canine teeth behind them in the image below of a coyote skull. Behind these are small premolars and finally molars at the very back of the mouth. The size, shape and orientation of all of these teeth vary great depending on the species. For instance, cats have relatively few teeth, proportionately large canine teeth and short rostrum; whereas wild dogs have more teeth, more premolars/molars, proportionately smaller canine teeth, and a long rostrum. Ungulates have a largely herbivorous diet, and this is reflected in their teeth. They have a row of sharp incisors at the front of their skull. Deer, pronghorn, bighorn sheep, mountain goats, bison and musk ox all lack upper incisors. The only native North American deer that has canine teeth is the elk. Behind the incisors there is a significant gap lacking any teeth, then finally a row of similar looking molars for grinding vegetation. 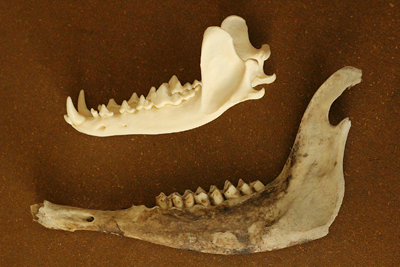 Notice the mandibles of a carnivore (the mandible at the top, from a raccoon) and that of an ungulate (the mandible at the bottom, from a deer). Look closely at how similar all of the teeth in the ungulate mandible appear to be when compared to a carnivore. Here's a couple examples of distinct features to look for to help you with skull identification. In ungulates, look for the presence of antlers (for deer family) or horns (for pronghorn, bison, musk ox, mountain goats and wild sheep). Also look for the presence or absence of a thin ridge of bone running down the middle and across the top of the braincase, called a "sagittal crest." The presence, shape and size of this sagittal crest can help identify certain species of carnivores. 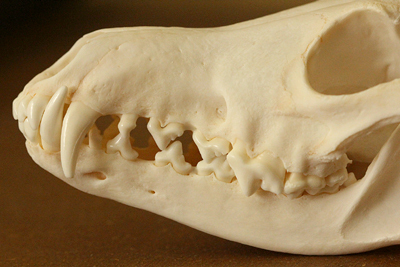 The image below shows the skull of a striped skunk. Notice the thin sagittal crest running the length of the cranium. Beyond the major parts of the skull, there are many other minor features and types of parts to get to know that are beyond the scope of this article. I recommend the skull books listed below and strongly suggest visiting a natural history museum to get hands-on knowledge of skulls. Skulls are fascinating and a wonderfully accessible part of the study of natural history and wildlife tracking. Skull identification skills are taught as part of the wildlife tracking curriculum at Alderleaf's Core Programs.